PA chief negotiator says EU should ban products from Judea and Samaria after passing resolution voiding agreements in that area. The Palestinian Authority (PA) welcomed on Monday evening the European Union’s (EU) passing of the resolution which stipulates that any agreements signed with Israel will not apply to Judea and Samaria. 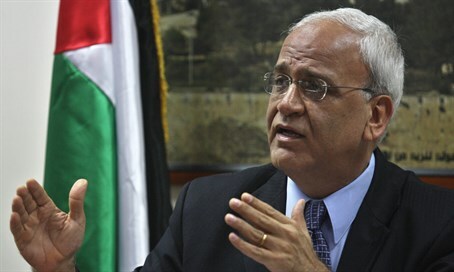 The PA’s chief negotiator Saeb Erekat said the EU decision was "a step forward towards accountability", but also called on the EU to take immediate steps and ban products from Judea and Samaria. The resolution states, "The EU expresses its commitment to ensure that - in line with international law - all agreements between the State of Israel and the EU must unequivocally and explicitly indicate their inapplicability to territories occupied by Israel in 1967." "This does not constitute a boycott of Israel which the EU strongly opposes," it adds. In Israel, meanwhile, officials expressed outrage over the passing of the resolution, noting it would encourage the PA to continue its “diplomatic war” against Israel as well as its incitement to terrorism against Israelis. Much of the incitement against Israel has been coming from PA officials, including Erekat himself, who recently paid a condolence visit to the family of a terrorist who shot and wounded two Israelis before being killed by the IDF. He also recently compared Jewish residents of Judea and Samaria to jihadists from the Islamic State (ISIS) group. Erekat’s comments welcoming the EU resolution came hours after he told Channel 10 News that Israel has kept agents and spies among the upper echelons of the PA's leadership, responding to the recent arrest of one his closest aides.